In Ken Burns’ nine-part documentary The Civil War, Shelby Foote notably described Nathan Bedford Forrest as one of “two authentic geniuses” generated by the Civil War. At another point in the series, Foote lays out Forrest’s maxims of war after calling the civilian turned soldier with no military experience before 1861 “a natural genius.” How did Forrest the civilian come to be Forrest, one of the most feared cavalry commands in the Confederate Army? Retired United States Army special forces general John R. Scales’ work seeks to answer that question. Scales is quick to point out that this book is not a biography of Forrest, and the only controversy one finds within these pages regarding the general is the wisdom or folly of his military decisions, which of course includes the April 12, 1864, action at Fort Pillow. To nail home this objective further, Scales begins the book with Forrest’s enlistment into the Confederate Army in June 1861 and concludes it in May 1865. The pages in between are filled with detailed descriptions of Forrest’s military movements. To help build his case at how Forrest gained his prowess, Scales hardly leaves a stone unturned, examining every action that Forrest participated in during the war, no matter how large or small. In his studies of these many campaigns and battles, Scales is quick to point out Forrest’s mistakes (if there were any), his successes, and what lessons he learned that made him successful at later points in the war. Following the latter throughout the book makes it easy to watch the upward evolution of the general’s military career. But Scales does not miss the forest for the trees. While examining Forrest’s military progression, Scales mentions the moments when the general’s actions had an impact on the Civil War at a higher level than the local one. Indeed, there are four times during his service from 1861 to 1865 that Forrest had a “significant and measurable impact on the overall course of the war”: his July 1862 attack on Murfreesboro, Tennessee that halted Don Carlos Buell’s campaign to occupy Chattanooga; Forrest’s operations in West Tennessee during the winter of 1862 delayed Federal occupation of Vicksburg; stalling the United States campaign to strike at the heart of the Confederacy by taking Selma and Mobile, Alabama in early 1864; and, finally, Forrest’s negative impact on the war, the confused fighting at Fort Pillow resulting in the massacre of black troops (441). One of the book’s real gems is the 109 maps produced by Hal Jespersen, which are each accompanied by a driving tour, allowing a reader to take what they learned on the page and apply it to the extant Civil War landscape in the Western Theater. Indeed, it becomes evident from examining the maps and reading through the driving directions that the author visited the site of most, if not all, of Forrest’s campaigns and engagements, viewed the terrain, and made his judgments on Forrest’s performance not only from a study of the written record but from a survey of the battlefield terrain. That’s a valuable lesson for any military historian, and here Scales excels. If you do a lot of driving through what was once the western Confederacy, keep this book handy in your vehicle; you never know when you might spring onto a Forrest battlefield! Overall, Scales’ work is a worthwhile addition to the Forrest historiography. It is an excellent examination of how someone with no prior military experience learned from his actions and propelled such a meteoric rise not often seen in the Civil War. 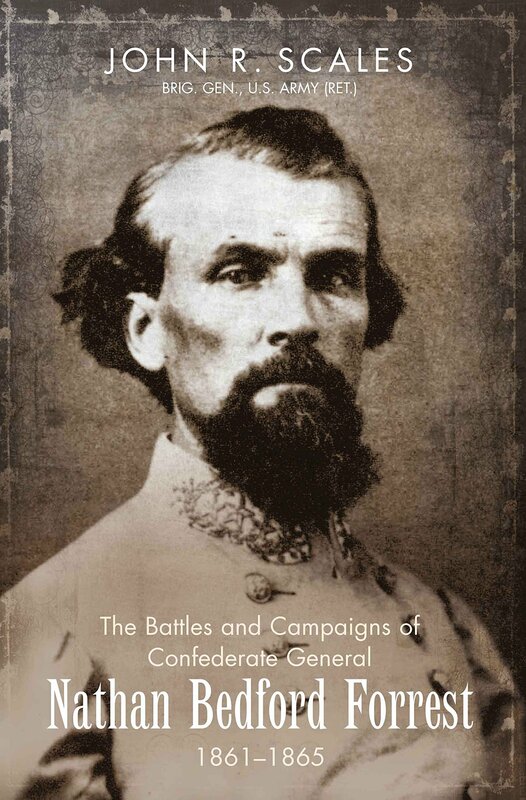 John R. Scales, The Battles and Campaigns of Confederate General Nathan Bedford Forrest, 1861-1865. 465 pages, 109 maps, footnotes, bibliography, index. This entry was posted in Book Review and tagged Book Review, John R. Scales, Savas Beatie, The Battles and Campaigns of Confederate General Nathan Bedford Forrest. Bookmark the permalink. I have been waiting so long for Gen. Scales book and it just landed on my doorstep this week. He has graciously spoken at our round table on a couple of occasions in Guntersville, Alabama and he is knowledgeable, precise and an all around good person. As cold as it is outside I may just get started today. Congrats John! Also don’t forget to check out his other book. The Atlanta Campaign book is very good and is unique. A well-done and helpful review, but – “Scales is quick to point out Forrest’s mistakes (if there were any)” – if there were any??? As one example, I’d point to Dave Powell’s excellent “Failure in the Saddle” in which he evaluates the mediocre performance of their duties by both Wheeler and Forrest in the Chickamauga Campaign. I agree with Powell sometimes, disagree other times – as documented in my book. That’s what scholarship is all about. The problem with Forrest is similar to the problem with Jackson – my own view is that the mythologists have had too much influence over the years. I note that in the introduction to your book which is accessible in kindle version at Amazon, you make a critical point about Jackson – distinguishing his record at the operational level and his tactical record (which I would characterize as consistently mediocre, often against a weak opponent). That bodes well for a balanced assessment of Forrest. I look forward to getting the book. Good catch. I didn’t mean to imply that Forrest did not make any mistakes or that Scales believes the same. What I meant to say is that in any engagement where Forrest made mistakes, Scales is quick to point them out. Kevin: After I posted I suspected that as a possibility. I’m so used to folks who don’t specialize in this area (such as Burns and his writers) labeling this guy as some sort of war-changing, once-in-a millenium “genius” that I am programmed to “jump”. As I indicated, the rest of this review is extremely helpful. To accompany John on a tour of one of “Forrest’s trails” is an excellent educational experience. His hometown Civil War Roundtable has benefited from his tour of routes of Streight’s Raid and the 1864 Mid Tennessee railroad raids. In 2018 he will lead us into Mississippi to study his successful resistance to the several Federal raids of spring and summer1864. Gen. Scales’ book sounds fascinating. Forrest was a brave and innovative commander. But, as John points out, he did make several costly mistakes. And while his raid into western Tennessee helped stall Grant’s first campaign against Vicksburg, Van Dorn’s destruction of Grant’s supply depot at Holly Springs was far more responsible for Grant’s retreat. And then there was Fort Pillow. Before Pillow, Forrest had issued no-quarter threats to other Union officers if they didn’t surrender. An argument could be made that Forrest was a war criminal. The best book I’ve read on Fort Pillow is River Run Red by Andrew Ward. Have to disagree about the primacy of Van Dorn’s effect based on Grant’s Memoirs – he credits his decision to the impossibility of keeping the supply lines open. By current terms many of the generals on both sides committed war crimes. There certainly were such crimes committed by individuals at Pillow, but had Forrest so ordered the carnage would have been much worse. I think Brian Steel Wills’ book on Pillow is pretty definitive. Again, Forrest was notorious for issuing black flag threats against Union forts and other outposts both before and after Ft. Pillow. Before Ft. Pillow, his take-no-prisoners threats usually worked. After Ft. Pillow, they didn’t. A postscript to Pillow: The massacre of blacks there probably cost thousands of Confederate soldiers their lives. Union colored troops – often crying “Remember Fort Pillow” – took similar no-quarter stances when Rebs tried to surrender during the waning months of the war. Rebel troops, often acting on orders from their officers, treated captured colored troops – the ones who weren’t fatally shot while trying to surrender – horribly. As I’m sure you’re aware, many captured colored troops were even forced into slavery. The terrible mistreatment of these troops was a major reason that Grant and Lincoln refused to exchange prisoners in the final 18 months or so of the war. Bob Ruth Actually I have to disagree somewhat. He did issue such threats, although he was not the only one to do so, but they were never executed. Even at Fort Pillow, with all its circumstances, less than half the occupants died. There were instances of Union soldiers who were surrendering who were killed in cold blood. That is undeniable, but orders to act in that manner were never issued by Forrest or Chalmers, who actually controlled most of the battle. Many white soldiers were killed among the number, although the proportion was somewhat less. And threats did work afterward, see Fort Henderson for example. It is noteworthy that the Union reports state the USCT fought harder at Pillow than the 13th Tennessee (US). It is interesting that more USCT were killed at the Crater, some by their fellow Union soldiers in a misguided attempt to ingratiate themselves with their soon-to-be captors, yet there is much less emphasis on this fight. I agree that the propaganda influenced the commission of war crimes by the other side as well, number unknown, at Blakely and Spanish Fort in particular, although “thousands” may be overstating it. Wartime propaganda, consciously intended to inflame regardless of what the particular facts may have been, continues to reverberate even today. Brian Steel Wills’ book, River Dyed Red with Blood, is I believe a complete and accurate account of Fort Pillow, consistent with other sources and the ground, which I have walked. The Confederate government considered the USCT as escaped slaves, property to be returned to their owners or, failing a clear owner, to be put to work on fortifications, Mobile in particular. Over 60 of the unwounded/lightly wounded USCT captured at Pillow were sent to Mobile for that purpose. Forrest obeyed the orders of his government with them as well as the many others he captured later. Prisoner exchange was halted for several reasons, one among them being this policy of the Confederate government to refuse to treat USCT as PoWs. Personally, I would rather have been sent to Mobile to work on fortifications rather than to Andersonville (or the comparable Union PoW cages). Who was at fault for the murders at Fort Pillow was controversial at the time and is still hotly debated. The best that can be said of Forrest – as Brian Steel Wills does in his book – is that the general lost control of his troops at a critical time in the battle. The worst that can be said is that Forrest did little to end the slaughter until it had naturally run its bloody course. Of course, Forrest’s antebellum occupation as a wealthy slave trader and his post-war leadership of the KKK adds fuel to those who believe the worst. As to your point about Forrest’s take-no-prisoners threats: Other officers might have issued similar ultimatums, but I have never heard or read of any general on either side who did it as consistently as Forrest. If you’re interested, I would suggest you read another “definitive” book on Fort Pillow – Andrew Ward’s River Run Red. Published about 10 years before Wills’, it includes heart-wrenching accounts of the cruelty inflicted on USCT soldiers by Rebels during and after the battle. As to your point about why USCT POWs were forced into slavery: Yes, the Confederacy considered many of them runaway slaves who should be returned to their one-time owners. But from what I’ve read, the Confederacy often was not too careful about determining whether a USCT POW was a runaway or was actually a freedman before the war. As to your point about black POWs from Fort Pillow faring better than white POWs, I agree with you. Many were treated as slaves, thus having value to slave masters. The white POWs, on the other hand, were sent to the hellhole Andersonville. Labeling any one a war criminal when over 150 years has past and you were not there is certainty not fair and judge mental . Suggest you read the Gen. book first . Sounds like a good and balanced book about Forrest. Thanks for mentioning the maps and how helpful they would be on a road trip. I think that makes it so I have to buy this book before the summer! Thanks for the review. I appreciate it!